I spent a lot of time digging through cheese books yesterday, trying to settle on a royal approach to the big diggity doo. British cheeses are such obvious choices, and I wanted something campy. When you want lactic glam, you go cheese ball. 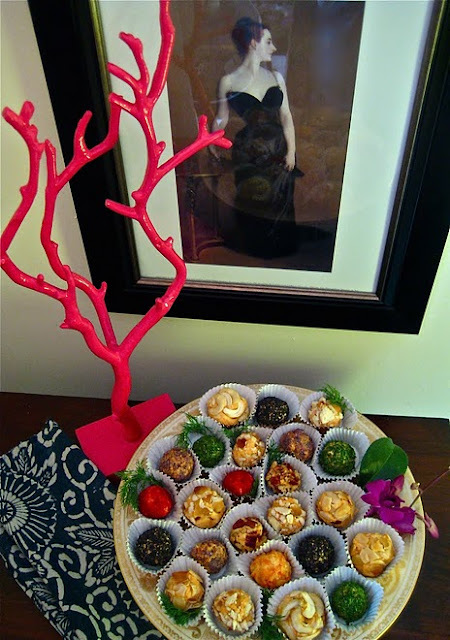 And so I called on my faux-debutante-loving impersonator, Linda Olle, who sent me this dashing photo of Liptauer Cheese Balls. Yes, I think the Middletons would approve. Who doesn’t like a little stink in the room? Blend with a paddle or by hand. Wrap and refrigerate for a few hours or overnight. An hour or two before serving, roll balls (approximately 15) in toppings. Roast nuts first in a pan on the oven and cool, before chopping. Toppings: pecans, cashews, sliced almonds, black sesame seeds, sweet paprika, parsley, crushed tortilla chips, crushed pretzels, etc. Do tell, what will you be serving, dahhhlink? Toast and Marmite? A wedge of Stilton? A hunk of Berkswell? Or maybe a twist on the obvious, with a round of Knight's Vail? Or will you hole up with a bottle of gin and avoid the whole crusty affair? Back in February, I told you about Mike Geno, a Philadelphia food artist working on an all-cheese series for a gallery in Seattle. Since then, Mike has accompanied me on a few cheese-buying junkets and posted his paintings on Twitter as he completes them, much to the delight of the cheese community. 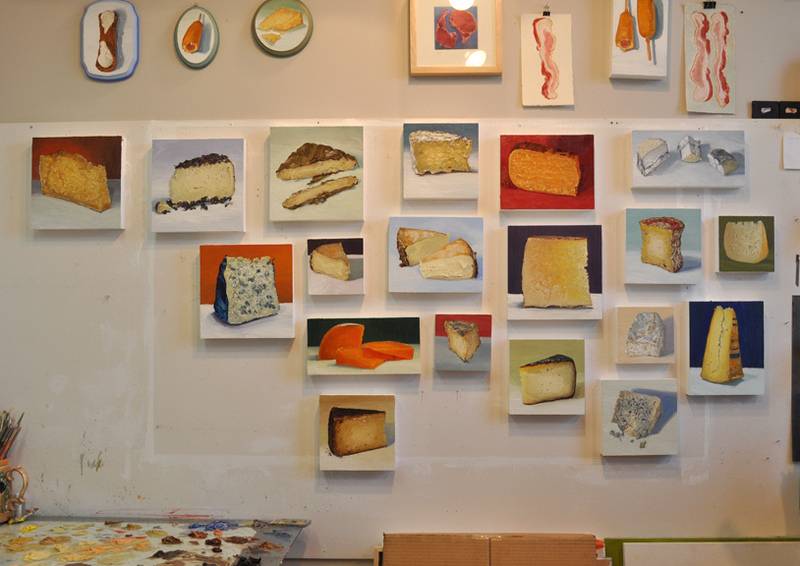 I wanted you to be able to see (and potentially purchase) these in person, so Mike and I are teaming up for a private studio visit on Saturday, May 7 from 3-6 p.m. It’s a chance for you, dear readers, to take in some cheese portraiture and nibble on wedges of what you see. Lo, a full body cheese experience. This will be the only chance to nab Mike’s stunning work before it gets shipped off to Cakespy Gallery for the June show. A number of the cheeses are local – like Doe Run's Hummingbird, Amazing Acres' Sea Smoke, and Bobolink's Drumm – and most, if not all, are artisanal. 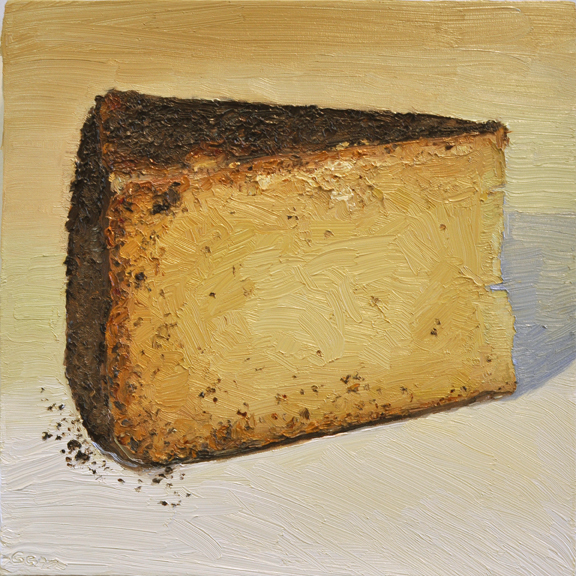 In a way, it’s a tribute show to some of the most beautiful cheeses being produced today. And a few that are no longer being produced, like Sally Jackson’s Renata. R.I.P. Mike has asked me not to publish his address online, so please drop me a note (tenayadarlington@gmail.com) if you’d like to attend and I’ll email you an invite. All paintings will be for sale; some of his work is also listed on etsy. For a preview, check out the show on flickr. I love when the first leaves pop, hot green and feather-tipped. Our North Philly neighborhood awakens. Cats appear. Then teenagers -- warming the walks as they hover in clusters. Soon my neighbors take to their stoops to read the paper and sip coffee or beer. That’s when I want Ascutney Mountain, a cheese that somehow tastes like spring. Like peas in their pods. That’s what Zeke told me he tasted when he handed me a sample of Ascutney Mountain several weeks ago at the cheese counter. Zeke has a palate of gold. I go to him as one would go to a guru, not for a mantra but for a tasting lesson. When my palate goes off-key, Zeke helps me find the note. “Fresh peas, can you taste it?” he asked. I couldn’t taste peas at first. But I did detect an Alpiney edge, that bell-clear herbiness I now recognize in mountain cheeses. Think of Appenzeller, Gruyere, Emmentaler. They all contain an herbal quality – not as in dill or parsley – but as in herbed spirits (think of Jagermeister or Chartreuse). Ascutney Mountain, which is made in Vermont, has an Alpine herbiness, but it’s more vegetal in nature, and less bitter and boozey, if that makes sense. It tastes fresh, I kid you not. Like greens. Like spring seedlings. I have eaten two wedges of it now, nibbling away through the gray days that haunted April. And now I taste pea pods. I do. Once I could identify it, I tasted it in every bite. Magical, how even taste grows. All it takes is nurturing. Gail Holmes at Cobb Hill Cheese in Hartland, VT makes Ascutney Mountain. She uses raw milk from Jersey cows, a breed known for its supremely creamy milk. That makes Ascutney Mountain gloriously creamy once it melts on your tongue. 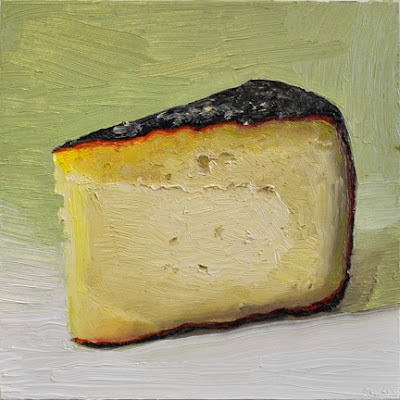 The texture calls to mind a young Gouda, with crispy crystals that pop on the togue – the mark of an aged cheese. If you like Comte, you will want to seek this out, though it’s rare. Only 45 wheels are made each week – fewer in winter, one assumes. Serve it with spring vegetables (ramps, morels, peas, fiddleheads) and a lush white or a light- to medium-bodied red. Prepare to shiver. Other notes to look for: fuitiness, nuttiness, a whiff of pineapple. Until this morning, I forgot how lovely it was to lounge on someone else’s couch, Bloody Mary in hand, on a Saturday morning. Especially when guests arrive with feathers in their hair, and Easter grass becomes the alfalfa of an otherwise whole grain, lox-and-capers affair. This morning, I rediscovered the pleasure of brunching. Forget the art of the cheese plate, and let’s talk about the essentials of a stellar late-moring soiree. It all depends on nosh and company. When comrades come to a party, a clique forms and no one leaves the kitchen. When you select a random assortment of friends, the room swirls. There is so much to talk about – conversation becomes the Easter Egg Hunt, yes! This morning I collected notes on how to make a cucumber gimlet (from a bartender), the history of sea shell collecting (from the author of an encyclopedia), and sketches of Philadelphia in the 1960s (from a revolutionary in a bandana). I also learned where to buy a smart second-hand suit. Establish a Bloody Mary Bar. Be sure to tape a recipe to the counter. Set out tomato juice, wedges of limes and lemons, Tobasco, a dish of celery salt, plus alternating olives and okra on bamboo spears. Then let everyone jostle and concoct. 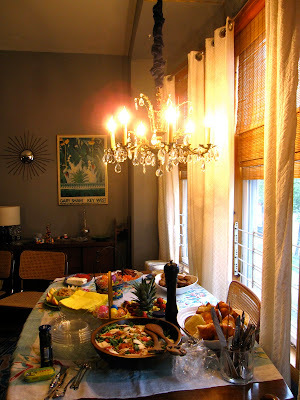 Hang a chandelier over the buffet. Let’s agree that a fabulous party is all about the lighting. Lox should look luminescent. The cream cheese should give off a pearlescent glow – not a glare. It’s a brunch, not an office party, so turn off the overhead fluorescents. Kick the guests out of the kitchen. Brunch should be vivid and encourage play. An artful arrangement of little dishes containing items that can be assembled to make a towering bagel or a regal salad is more fun than an egg casserole, say. Consider: anchovies, capers, cheeses, lox, pickled veggies, scrambled eggs, lightly dressed arugula, bacon, a bread basket. That’s right. Nothing brings people together like a crisis -- when the fire alarm goes off because the oven is smoking, everyone rallies around the cause. Laughter ensues. More drinks get poured. And then it’s time for seconds. Many thanks to this morning’s hosts for extending their West Philadelphia hospitality to a Fishtown stranger. Someone needs to start a brunch blog. Hint. Hint. Until I moved to Philadelphia, I rarely encountered anyone who worshipped ricotta. But here, the Italian influence runs deep, and even my students – most of whom don’t venture beyond the deli case for cheese – grow dewy eyed when they mention reh-gott-uh. And that’s how they say it. Reh-gott-uh – you’ve got to roll the “R” and put breath into the last syllable. It should sound like a hairy Italian grandmother has taken over your body. Ricotta isn’t hard to find, but I’ve learned that there’s a big difference between fresh ricotta and commercial brands. Your storebought versions tend to be watery and chalky – the texture reminds me of taste buds. At Claudio’s, in South Philadelphia, the hand-made ricotta is cloud-like, not unlike mascarpone. Last night, I tried some local goat ricotta from Shellbark Farm -- it was grainy, like fine cottage cheese -- which only made me pine for the pillowy ricotta from Keswick Creamery. Today, I went to the Italian Market on a singular mission. To find the right cheese for a resurrection dinner party. I wanted a cheese that had died and come back to life. 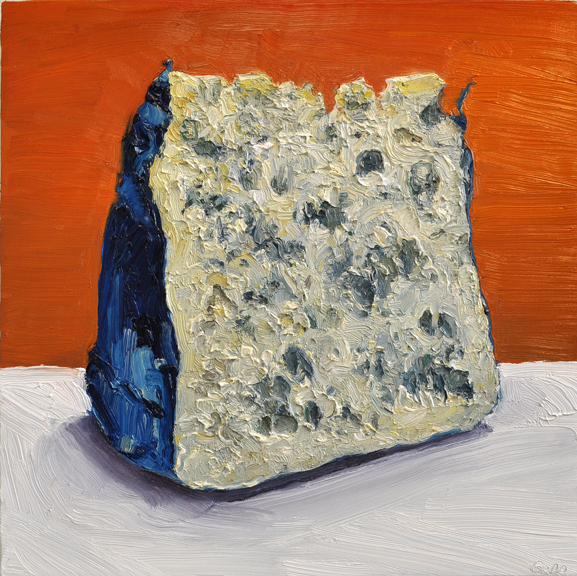 A cheese that had undergone death and rebirth. This is a new discovery for me. I am a washed-rind lover and an Alpine fiend – the mild cheeses have yet to woo me. But baked ricotta is another story. It’s toasty, like a slightly charred marshmallow. And the texture is damp and dense, with a fine skin of sweetly burnt crust. I don’t know what makes baked ricotta rise. But it does. Then it slumps. I bought this wedge from the amazingly mustachioed Adam Balkovic at Di Bruno Bros. (he is famous for his Man Loaf), but I have read about baked ricotta. There are many recipes for those of you who like damp heat and burnt sugar. As for me, I plan to serve my baked ricotta slightly warmed, with honey, berries, and few blanched almonds. If you don’t hear from me again, you’ll know that I’m hanging out with bosomy Italian ladies, whispering reh-gotta-uh in order to enter the gates of heaven. Most people who enter into a relationship with sheep’s cheese expect a robust, salty hunk – think of your Pecorinos from Sardinia, your Manchegos from La Mancha. These hard, earthy cheeses can be addictive, but they often require a sweet sidekick, like honey or quince paste, to offset their briny temperaments. Ewephoria doesn’t need a sweetheart. It’s all brown sugar on its own. In fact, this Gouda-style cheese from Holland is so sweet you can serve it for dessert, and if you tell your guests that they are eating pineapple upside-down cake pressed into cubes, they just might believe you. After all, Ewephoria smells like rum and tastes – I kid you not – faintly of pineapple. To continue reading, please visit the Di Bruno Blog. Full disclosure: I freelance for Di Bruno Bros. twice a month. 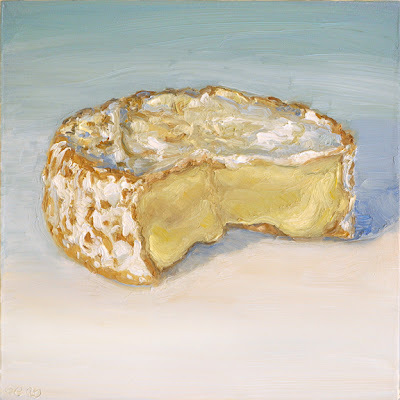 They pay me to write about cheese for their blog, and I run a nugget of the post here. Some people seek out shot glasses when they travel. Me? I don’t buy memorabilia, but I always try to order a cheese plate. I like to sample dairy from different parts of the country, and I store my best memories in my belly and in my mind, not on windowsills or in shadowboxes. After oogling the glorious cheese cave at Star Provisions, the general store that fronts this luxe purple lounge, I sat down to a tasting menu that included two Georgia cheeses. First, I sampled Little Martha, a fudgy, salty cow’s milk from Flat Creek Lodge in Swainsboro, GA. It reminded me of a recent encounter I had with a stunning little robiola -- tender, creamy, with a bloomy layer surrounding its satiny heart. First-of-the-season strawberries offset the saltiness, which was pleasant, not overdone. My photos don't do it justice. Next came purple beet sorbet with fresh goat cheese from Sweet Grass Dairy. The goat cheese was fresh and bright tasting, and the cold, earthy sorbet was a glorious foil. Oh Georgia, I am coming back! Two nights later, I taxied off to Restaurant Eugene, headed by Chef Linton Hopkins, a 4-time James Beard nominee. There, amid blooming quince branches and black napkins, I tried a gem of an aged goat cheese from North Carolina, Looking Glass Creamery’s Early Bird. Chef Hopkins served a pie wedge of Early Bird with a line of accompaniments: spiced peanuts, pickled blackberries, and lo, a swoosh of sorghum foam. Sorghum foam? Imagine whipped molasses. Sweet, nutty, and earthy – pure genius. When I got home, I wrote the kitchen for instructions, and the folks at Eugene were kind enough to write back with the recipe. The recipe is very simple and takes only a few minutes. We use a product called Versawhip 600k to facilitate the creation of the foam. Versawhip is pure soy protein so there are no weird chemicals involved. If you have a Kitchen Aid or other stand mixer, just pour a splash of water in the bottom and add 5% of the total weight of sorghum in VW600k. Stir together and then add the sorghum (or honey, molasses etc.). Now whip on high speed until the volume increases and achieves a nice fluffy texture. 25g of Versawhip and 500g of sorghum yields several quarts of finished foam and the foam will hold its structure all day without collapsing. VW600k has no odor or flavor and dissolves compeltely during whipping so the end product tastes only of the main ingredient. Below are a few links to websites which sell the Versawhip in powdered form, the same that we use at Restaurant Eugene. If you have any questions, please feel free to contact me directly at any time. Many thanks to Pastry Chef Aaron Russell of Restaurant Eugene for providing this recipe. If you've ever wondered about the microscopic life of cheese, come to "The Artisanal Microbe," a cheese talk and tasting hosted by the Franklin Institute at Di Bruno Bros. (1730 Chestnut St.) next Wednesday, April 20 at 6:30 p.m. I'll be there, along with scientist-turned-cheesemaker Al Renzi of Yellow Springs Farm. Al and his wife Catherine make award-winning goat cheese in Chester County, including Nutcracker and Red Leaf. 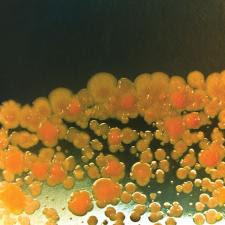 "The Artisanal Microbe" is a free event, but you'll need to grab a ticket. The Philadelphia Science Festival runs through April 28. When summer comes, one of my dreams is to drive to northern Vermont. The state is home to so many of my favorite people and wedges, from the master affineurs at Jasper Hill to the gorgeous wheels of Cabot Clothbound Cheddar, Lazy Lady goat cheese, and Winnemere. Tiny as it may be, this jewel is pungent, beefy. Think of your grandmother’s thick black shoes, then add the smell of sweating onions. Fans of Red Hawk will find it an interesting foil. The texture is silken, pudgy -- I wanted a little more weepy drape, but the flavors were delightfully beefy and buttery with a resonant barnyard shiver. Add some dark beer, brown bread, and fig jam, and you've got my idea of a stoop-sitter's picnic. There’s a lovely story about this cheese in the April issue of Bon Appetit (see “A Slice of Vermont”). As a lapsed subscriber, this piece made me want to reconsider reading Bon Appetit again. The pictures were great, especially the photo of Oma von Trapp in her white bun and cardigan. 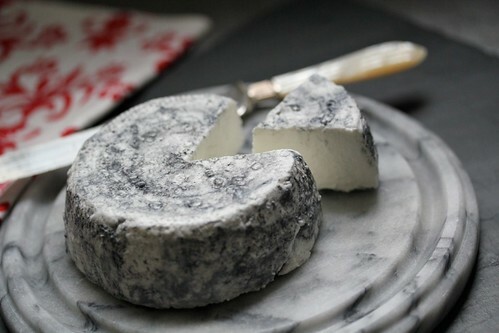 You could say that Selles-sur-Cher is the Catherine Deneuve of goat cheeses, achingly fresh and flawless. It’s the sort of cheese you can’t possibly tire of, and it’s as sparkly for supper, crumbled over salad, as it is for breakfast, slathered on toast with jam. To continue reading, please visit the Di Bruno Blog. This is one of those meals that comes out of doldrums and cabinets. Call it April Showers Risotto. It was made on a recent gray night, when the only bright bulbs were a handful of kumquats on my kitchen counter and a few slack carrots in the crisper. Rainbow-colored carrots, thank gawd. Madame Fromage had spent the day engaged in listless electronica, answering long-lost emails and staring out the window for ships, mascara from the night before raining under her eyes. You know those days. The catch-up days, the days of feeling caught in between -- between moods and seasons and weather patterns. Then this sunny voice commanded me forward and said: dig around in the back of the fridge, root around in the cupboards, go to work, Madame Fromage. Get your fingers busy and make the most of the dregs! And so I opened the Chardonnay I'd scowled at for weeks, and I hauled out the bag of barley I had never opened, and I grabbed a handful of this-n-that. I threw it all into a dinged-up pot, and a phoenix emerged. Let it be known that I fear risotto. I only eat it in restaurants. Recipes for it intimidate me, and so this is not a real risotto but a false risotto -- let there be no pretenses. It could also be called carrots-and-kumquats-boiled-with-grain-into-manna. The crucial elements here are: good carrots, barley, something in the orange family (zest will do), decent stock, toasted nuts and drop-dead feta. Otherwise, improvise! Go to your cupboards, and matchmake. This is a forgiving enterprise. Get out a nice big saucepan that has a lid and toast the barley in a little oil. By toast, I mean, crank up the heat on the oil, then toss in the dry barley, and let it brown a little -- no more than 10 minutes. Then add the stock, wine, rosemary, dried cranberries, and kumquat slices. Bring to a boil, then turn it to low and cover. It will need 1 hour under wraps. While barley mixture is cooking, saute onion. Add this to barley, along with carrots, after about 45 minutes, so that carrots cook but remain tender, nut mushy. Taste barley for doneness, then dish into bowls and top with feta and toasted almonds. If Max McCalman were a cheese, he would be Mimolette – dry, vaguely sour, with a touch of sweetness. He never smiles. He rarely raises a brow or changes his tone of voice, but if you listen carefully you will detect the passionate connoisseur living below the dense crust. On Monday night, I met Max McCalman, author of Mastering Cheese – a book so fascinating and brilliantly written, I keep it on my nightstand. No other cheese book that I’ve read imparts as much expertise so beautifully. Although it’s designed like a textbook, it reads like a thriller – well, sort of. You have to be the kind of reader who shivers pleasurably at the thought of Pencillium Roqueforti. Monday’s meeting was a French wine and cheese tasting with McCalman, who is rumored to maintain hundreds of spreadsheets on just such pairings. Since 1997, he has catalogued and ranked every wine-and-cheese combination he’s eaten, uploading favorites to his phone for quick consultation at Picholine. Now he is the figurehead at Artisanal. All this to say, I trembled within as I rode the train from Philadelphia to New York. The tasting was held at the French Institute (FIAF). Think berets, women in good shoes. Seven cheeses were arranged in fans at each place setting, along with three wines. Then came score sheets, baguette rounds, and lipsticked smiles. The wines – two white, one red – all shared a fruity quality, verging on too sweet for my taste. And yet, they worked with every cheese! Some combinations were better than others, but it was curious to note how each wine bent and shifted, drawing out different flavors from the seven cheeses. 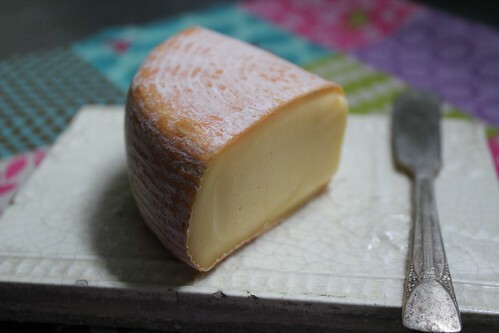 For example: Beaufort, a complex Alpine cheese similar to Comté, tasted flat with the Sauvignon, flowery against the Pinot Noir, and cheddary astride the Jurancon Cuvée Thibault. Another surprise: Brie Châtelain + Pinot Noir Réserve = cherry cobbler. I didn’t care for this wine (I kept smelling soy sauce and spare ribs), but the Brie brought out the loveliest cherry notes. White wines are easier to pair with cheese than reds. Scrimp on the wine but splurge on the cheese – it will make the wine taste better. Eating the caramelized crust of your baguette makes cheese harder to digest. The appetite for cheese in the U.S. has tripled since 1997. The tasting gave me a new appreciation for wine and cheese pairings – while it’s fun to play around at home, the wisdom of a maitre fromager certainly makes a difference. And now I know a little more about my cheese idol, including what he has for breakfast. No, not cheese. Espresso with honey. Later, he eats cheese throughout the day -- 2 pounds a week. His cholesterol is perfect. For more of McCalman's expertise on wine and cheese pairings, check out Artisanal, where he offers information, classes, and more.